No doubt the Camino de Santiago is the typical tourist attraction visited by tens of thousands of people where, constantly, you find yourself suddenly with the most amazing or amusing anecdote. These two adjectives are applicable to the achievement of a group of pilgrims who made the road from Dublin, capital of the Republic of Ireland and most populous city of the island. 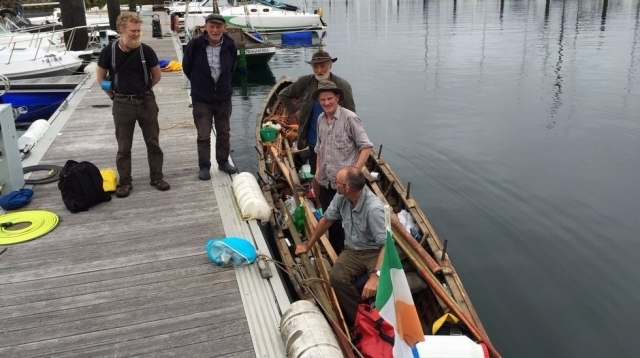 Naoimh Gobnait is the name of a boat, a traditional Irish boat built according to tradition by two of the pilgrims who, after two years of planning, this week finally reached Santiago de Compostela following the English Way. A boat seven meters handmade that has sailed from Dublin to the port of La Coruna in different steps performed for two years: the first stop was in Brittany, later rested in San Sebastian and finally reached the Galician port . But, contrary to what might seem, Naoimh Gobnait not remain moored in the port of La Coruna. Its builders and sailors decided to carry the boat and, recently, the Cathedral of Santiago saw his feet came these intrepid pilgrims with his "fellow traveler".